Mushrooms are one of the foods that Dr. Fuhrman wants you to have everyday. We found this vegetarian stroganoff dish from GroundedNutrition and adapted it to our liking. Prepare onion, garlic, mushrooms and celery. Saute onion and garlic with a little water until tender then add sliced mushrooms and celery cooking until all the juices are released and the mushrooms are cooked. Combine nut milk, dijon, soy sauce, and vegetable broth. Add the liquid to the vegetable mix. Cook brown rice or quinoa pasta or make raw zucchini pasta or both. Once Pasta is cooked, strain, rinse quickly with cold water then serve. 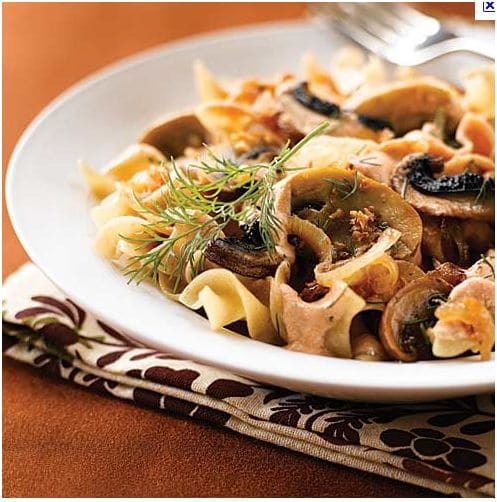 Top the pasta with the Mushroom Stroganoff.